Peoria City Hall is located at 419 Fulton Street, Peoria, IL 61602; phone: 309-494-8524. Photo: Pettingill-Morron House, ca. 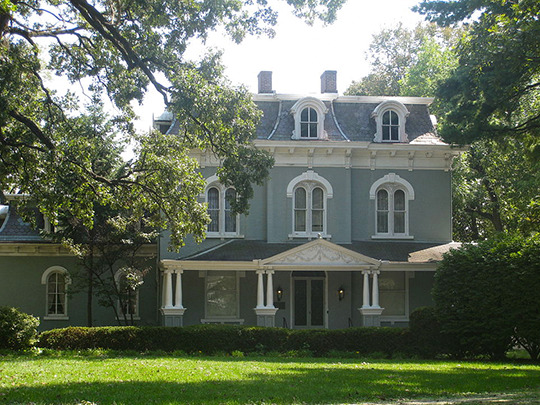 1868, 1212 West Moss Avenue, Peoria, IL Listed on the National Register of Historic Places in 1976. Photographed by User:Mmikhailova (own work), 2012, [cc-by-3.0 (creativecommons.org/licenses/by/3.0)], via Wikimedia Commons, accessed June, 2014. Located along the Illinois River, Peoria was first platted in 1825, incorporated as a village in 1835 and incorporated as a city in 1845. Peoria offers everything that the city dweller could desire. Big enough to serve you with modern conveniences, modern necessities, modern merchants; small enough to allow the city man to have breathing space and a garden in his city-home yard. Small enough so that the man on his rural acre can drive the heart of the city in a few minutes; large enough to command respect and consideration. In the heart of the richest agricultural and livestock producing area in the world, Peoria is the center of activity in the marketing of livestock and farm produce and the preparation of these products for consumption. Illinois river steamers provide both freight and passenger service from Peoria north to La Salle and south to St. Louis and the Mississippi river Peoria also holds a vantage point on the proposed "Lakes to the Gulf" deep waterway. There is no city in the country the size of Peoria where labor and production are on a more even basis. The manufacturer in Peoria can look forward to uninterrupted business and labor can see a full year of steady income. There is but one city in the United States that has a larger per capita wealth than the city of Peoria. There are 105,000 shoppers within a trade area of six miles who spend $75,000,000 annually. There is a buying power of $732 per capita for these buyers against $172 in Chicago, and Peoria homes having annual incomes of $1,800 are 31 percent of the total, compared to 13 percent in the United States as a whole. Peoria has 5 national and 8 state and savings banks, 30 grade schools, in a constant state of improvement, 4 high schools, 8 parochial schools, 2 colleges, 2 public libraries, 99 churches, 5 hospitals, 10 parks, 3 golf courses, 2 auto tourist camps, one aviation landing field, one recreation center of large proportions, 12 theaters, 17 clubs and a hotel capacity for 4,000 guests. Peoria is the center of manufacturing for many nationally advertised products, and in all produces, manufactures and markets more than 60 different products. † W. R. Jenkins, Prosperous Peoria: a Beautifully Illustrated Rotogravure Book, n.d. (probably ca. 1925).